It's a stuffed quesadilla with a crunchy center, a crunchwrap! Get creative with the fillings. 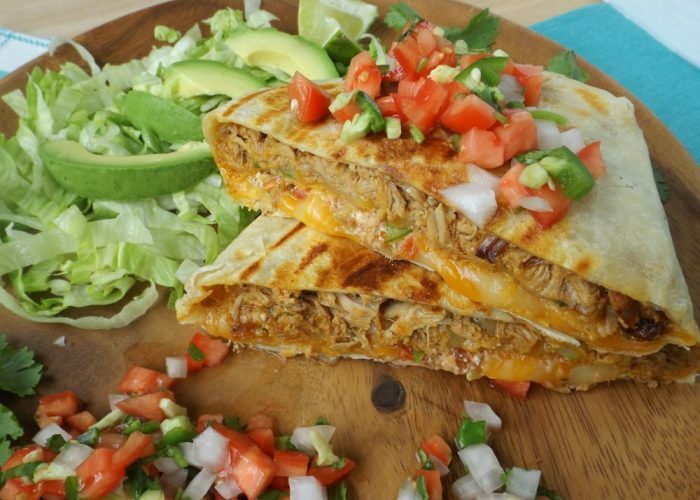 With or without meat, this crunchwrap makes for a great appetizer or lunch. What is a crunchwrap? A crunchwrap is a stuffed quesadilla! And when I stay stuffed, I mean it's loaded with delicious ingredients. This recipe is inspired by that popular chain restaurant with the big bell logo (you know the one). 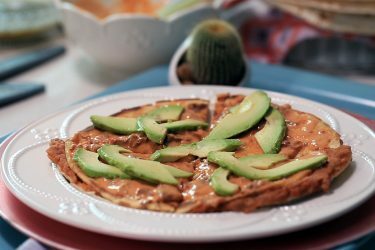 After preparing countless traditional Mexican quesadillas and sincronizadas, it's just fun to try something different. 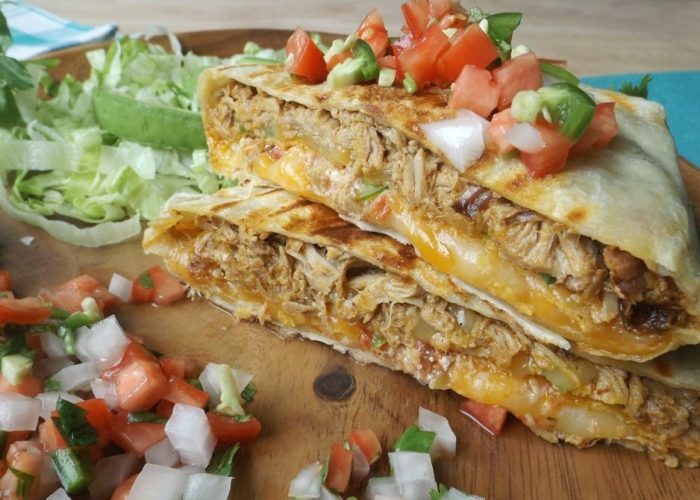 Your friends and family will not be disappointed when you present them with this tasty, cheesy and crunchy stuffed quesadilla. For me, the star ingredient, besides the cheese, is that crunchy corn tostada in the center. I don't know about you, but I love the different textures when enjoying my favorite foods. 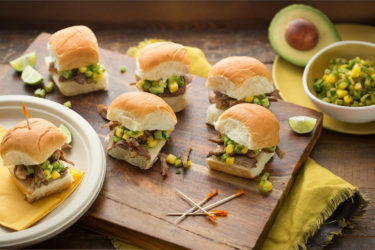 Grab your tortillas and try some different fillings today! Soften the 12-inch flour tortillas. Toss the meat with a couple of tablespoons of your favorite hot sauce. To the center of the tortilla, add 1 cup of shredded meat to form a 4-inch flat circle. Preheat stove-top grill pan or skillet to medium/low heat while you prep your stuffed quesadilla. Then on top of the meat, add 1/3 cup shredded cheese, sliced jalapeños, 1 corn tostada, 2 tablespoons sour cream, 1/4 cup salsa, more cheese and then the small flour tortilla. Fold up the sides of the large tortilla up and around to form an almost hexagon shape. Using one hand to hold the quesadilla in place, brush seam side with oil. Carefully flip seam side down onto hot surface. Turn heat up slightly. 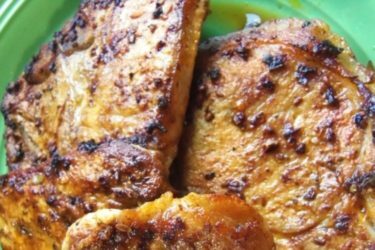 Grill or cook until tortilla gets golden brown and crisp. Brush oil on top side before flipping over. Continue cooking for a few more minutes until brown and crisp. To brown the sides, pick up with tongs and brown sides, turning as needed. Place quesadillas onto cutting board and let rest for a few minutes before slicing into wedges. Serve with extra fresh salsa, sour cream, avocado and lettuce. When preparing your crunchwrap, choose ingredients that don't have a lot of liquid or broth. For example, a chunky salsa with a thick sauce or meat with a little broth works best. Make it with roasted veggies and serve it at room temperature!